A little over a month ago +Francois Beaufort announced password support for ZIP files in Chrome OS. This is one of the issues in Chrome OS you hear complaints about every now and then, but I have not heard much about this new feature in the past month. Often +Francois Beaufort posts are issues / solutions upstream in the dev channel, so this may not have reached stable yet. Today, I am on the beta channel, I password protected a zip file on my Linux Mint 17.1 and uploaded it to Google Drive. As you see in the video as I open the password protected zip file I can see the file but not access it. When I copy and paste it to the download folder I am asked for a password to access the file. As a general rule I don't think password protected files beat encrypted ones. There are countless sites on the internet that help you break password protected files. Yet password protected zip files can be a good low tech solution for files in transit that you'd like a little extra security with. 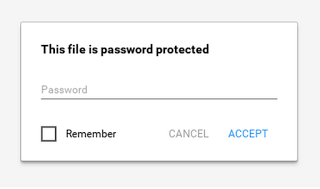 You also may have password protected zip files that you need to access on Chrome OS.